A femoral hernia repair, or herniorraphy is a surgical procedure performed to reposition tissue that has come out through a weak point in the abdominal wall near the groin. In general, a hernia is a protrusion of a loop or piece of tissue through a weak spot or opening in the abdominal wall. 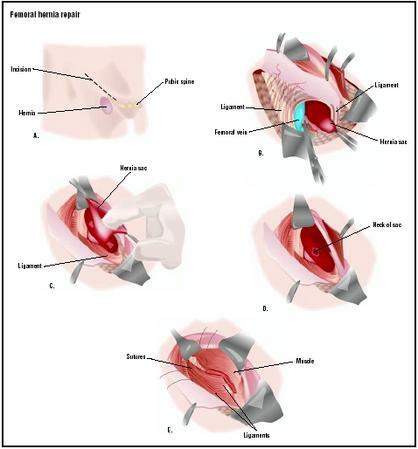 There are several different kinds of hernias; they are named according to their location. A femoral hernia is one that occurs in a person's groin near the thigh. In a child, a femoral hernia is usually the result of incomplete closing of this area during development in the womb. Femoral hernia repair is done to reduce the patient's risk of a future surgical emergency. A hernia may be congenital (present at birth) or may develop later in life because of a weakness in the abdominal wall. If the opening is very small, the amount of tissue that can push through it is small, and the person may barely be aware of the problem. One complication that may arise, however, is that the tissue that comes out through the opening can become incarcerated, or trapped. If the herniated tissue has its blood supply diminished because of pressure from other nearby organs or structures, it is referred to as strangulated. Strangulation may lead to gangrene, which means that the affected tissue can die and be invaded by bacteria. Femoral hernias are more likely than other hernias to become incarcerated or strangulated because the affected tissue pushes through a relatively small and closely confined space. Because of the increased risk of eventual strangulation and gangrene, the patient's doctor may recommend surgical repair of the hernia. Femoral hernias are a relatively uncommon type, accounting for only 3% of all hernias. While femoral hernias can occur in both males and females, almost all of them develop in women because of the wider bone structure of the female pelvis. Femoral hernias usually grow larger over time; any activity that involves straining, such as heavy lifting or a chronic cough, may cause the hernia to enlarge. Poor abdominal muscle tone, obesity, and pregnancy also increase a woman's risk of developing a femoral hernia. Most femoral hernias develop on only one side of the patient's abdomen, but about 15% of femoral hernias are bilateral. These bilateral hernias are more likely to become strangulated. An additional 20% of femoral hernias become incarcerated. Femoral hernias are more common in adults than in children. Those that do occur in children are more likely to be associated with a connective tissue disorder or with conditions that increase intra-abdominal pressure. Seventy percent of pediatric cases of femoral hernias occur in infants under the age of one. Femoral hernia repair may be performed under either general or local anesthesia. The repair of the hernia involves a cut, or incision, in the groin area (near the thigh), adjacent to the femoral artery. The surgeon locates the hernia, and reduces it by pushing the protruding tissue back inside the abdominal cavity. A hernia is referred to as reducible when the tissue that has come out through the opening can be pushed back and the opening closed. If incarceration or strangulation has occurred, the hernia is referred to as irreducible. The procedure may be performed using the traditional open method, which requires a larger surgical incision, or by a laparoscopic approach. A laparoscopic procedure is performed through a few very small incisions. The hole in the abdominal wall may be closed with sutures, or by the use of a fine sterile surgical mesh. The mesh, which provides additional strength, is sewn into the abdominal wall with very small stitches. Some surgeons may choose to use the mesh when repairing a larger hernia. A hernia repair done with a mesh insert is called a tension-free procedure because the surgeon does not have to put tension on the layer of muscle tissue in order to bring the edges of the hole together. A laparoscopic hernia repair takes about 40 minutes to complete. consult the doctor because of pain in the groin area or the inside of the upper thigh. The pain or discomfort of a femoral hernia may come and go, increasing when the person coughs or strains. If the pain is severe, the patient may go to an emergency room. In young children, symptoms of an incarcerated femoral hernia include severe irritability, abdominal pain, cramping, and vomiting. Adult patients may have also felt a mass in the groin that may be tender when it is pressed. Patients in severe pain may be given a sedative or pain-killing medication so that the doctor can examine the groin area and try to guide the herniated tissues back through the abdominal opening with gentle manual pressure. In adult patients, the doctor will rule out the possibility that the pain is caused by an enlarged lymph node, a lipoma, or an inguinal hernia. Imaging studies are not generally used in diagnosing a hernia unless the doctor suspects that the hernia is incarcerated or strangulated. A strangulated hernia can be distinguished from an incarcerated hernia by the presence of fever; pain that persists after the doctor has reduced the hernia manually; and pain that is more severe than warranted by the examination findings. If the doctor suspects that the hernia is strangulated, he or she will give the patient a broad-spectrum antibiotic (usually cefoxitin) intravenously before the patient is taken to the operating room . Adults scheduled for a nonemergency herniorraphy are given standard blood tests and a urinalysis . They should not eat breakfast on the morning of the procedure, and they should wear loose-fitting, comfortable clothing that they can easily pull on after the surgery without straining their abdomen. Aftercare depends on several factors: the patient's age and general health status; the type of surgery (open or laparoscopic); and the type of anesthesia administered. Immediately after the procedure, the patient will be taken to the recovery area of the surgical center and monitored for signs of excessive bleeding, infection, uncontrolled pain, or shock. An uncomplicated femoral hernia repair is usually performed on an outpatient basis, which allows the patient to go home within a few hours of the surgery. The patient will be given instructions about incision care , which will depend on the type of surgery and the way in which the incision was closed. Sometimes a transparent dressing is placed on the wound that the patient can remove about three days after the procedure. Very small incisions, such as those used for laparoscopic surgery, may be closed with Steri-strips® instead of sutures. The incision should be kept dry, so patients should take a sponge bath rather than a shower or tub bath for several days after surgery. Adults should avoid heavy lifting for several weeks after a hernia repair. The surgeon can give the patient advice about specific weight limits on lifting. Contact sports and vigorous exercise should be avoided for about three weeks after a femoral hernia repair. Many patients will be able to return to most of their daily activities in a few days, with complete recovery taking about a month in patients without other medical conditions. All surgical procedures have associated risks, both surgical and anesthesia-related. Bleeding and infection are the two primary surgical risks. The risk of infection for an uncomplicated femoral hernia repair is about 1%. Anesthesia-related risks include reactions to the anesthetic agents, including interactions with over-the-counter and herbal preparations, as well as potential respiratory problems. There is a small risk of recurrence of a femoral hernia. In addition, female patients are at some risk of injury to the nerves and blood supply of their reproductive organs, because femoral hernias develop in a part of the abdominal wall that is close to the uterus and ovaries. Normal results with timely diagnosis and repair of a femoral hernia are a smooth recovery with no recurrence of the hernia. The mortality rate following an uncomplicated femoral hernia repair is essentially zero. The mortality rate for repair of a strangulated hernia that has necessitated a bowel resection is higher, however, ranging from 5–19%. Morbidity following an uncomplicated herniorraphy is low; one Danish study reported that the most common complication, reported by 8% of patients, was pain during procedures performed under local anesthesia. A British study of laparoscopic hernia repairs found that only 22 out of 3017 patients reported recurrence of the hernia. The incidence of postoperative swelling and bruising was 8%. There are no medical or surgical alternatives to a femoral hernia repair other than watchful waiting. There is some risk that the hernia will enlarge, however, which increases the risk of incarceration or strangulation. Moreover, the complications and risks of surgery increase with incarcerated or strangulated hernias. Once a hernia is suspected or diagnosed, it should be evaluated by a surgeon within a month to lower the risk of complications. See also Incisional hernia repair ; Inguinal hernia repair . Ashcraft, Keith W. Pediatric Surgery . Philadelphia, PA: W. B. Saunders Company, 2000. Delvin, David. Coping with a Hernia . London, UK: Sheldon Press, 1998. Callesen, T., K. Bech, and H. Kehlet. "Feasibility of Local Infiltration Anaesthesia for Recurrent Groin Hernia Repair." European Journal of Surgery 167 (November 2001): 851-854. Kapiris, S. A., W. A. Brough, C. M. Royston, et al. "Laparoscopic Transabdominal Preperitoneal (TAPP) Hernia Repair. A 7-Year Two-Center Experience in 3017 Patients." Surgical Endoscopy 15 (September 2001): 972-975. Kulah, B., A. P. Duzgun, M. Moran, et al. "Emergency Hernia Repairs in Elderly Patients." American Journal of Surgery 182 (November 2001): 455-459. Manthey, David, MD. "Hernias." eMedicine , June 22, 2001 [June 6, 2003]. http://www.emedicine.com/EMERG/topic251.htm . American Academy of Family Physicians. 11400 Tomahawk Creek Parkway, Leawood, KS 66211-2672. (913) 906-6000. E-mail: fp@aafp.org. http://www.aafp.org . American Academy of Pediatrics. 141 Northwest Point Boulevard, Elk Grove Village, IL 60007-1098. (847) 434-4000. Fax: (847) 434-8000. E-mail: kidsdoc@aap.org. http://www.aap.org . American College of Surgeons. 633 North St. Clair Street, Chicago, IL 60611-3231. (312) 202-5000. Fax: (312) 202-5001. http://www.facs.org . Hernia Resource Center. http://www.herniainfo.com . National Library of Medicine. http://www.nlm.nih.gov . Esther Csapo Rastegari, R.N., B.S.N., Ed.M. This procedure is performed by a general surgeon. As with any procedure, the more experience the surgeon has with the particular surgery being performed, the better the expected outcome. A femoral hernia repair is usually performed on an outpatient, or ambulatory, basis in a hospital. After a few hours of recovery in the surgical center, the patient is able to return home. How many femoral hernia repairs have you performed? How many femoral hernia repairs have you performed with a laparoscope? What kinds of complications have your patients experienced? What limitations will there be on my daily activities, such as returning to work, driving, or lifting a toddler? THIS article was very informative but I am having trouble finding anything on a Femoral Hernia during pregnancy. I am due in 7 weeks and have a femoral hernia. Should I do a natural birth or is csection best? I don't want the hernia to get worse. Also I am o.k with a c-section, but my doctor will not tell me which will be the better option for me. Could you help me regarding this matter? I had bilateral (both sides) femoral hernias during my pregnancy. I ended up having a c-section as my obstetrician agreed there were more than just a few risks with going natural. He didn't want to sway me either way as they can't do that. I was fine with a c-section as it meant my bub would be safe - I wasn't willing to risk him. 1yr on hernia doesn't bother me much but am looking at getting pregnant again so am seeing a surgeon to see if they need fixing first. Towards the end of my pregnancy I was very uncomfortable with 2 of them and don't want that again with a toddler to run after! Good luck. I have had three femoral hernias fixed before the age of 28 (one on the right, two on the left) and am now looking at having children. Since one of my hernia repairs was due to a recurring hernia I am just a bit worried that carrying and/or having a child naturally will cause another one. I know that supposedly all that mesh inside of me makes it almost impossible to happen, but it did on one side and I still have pain just lifting more than 10 lbs. Any professional advice or experience? I'm 28 years old. I had two femoral hernias before the age of 10(one on the right, one on the left). it repaired at that time but 3 years ago it appeared again and fixed. I am due in 21 weeks. Should I do a natural birth or is csection best. Could you help me regarding this matter? Very informative article. I am due to have a femoral hernia repair and I was wondering how long after surgery may I resume normal sexual activity. Femoral hernias can lead to varicose veins and spider veins. I have had my few spider veins treated with saline injections and I have also had phlebectomies (vein removal with a crochet like needle) on the same leg. Recently I was diagonosed with a femoral hernia, no wonder the spider veins kept reappearing. The procedures hurt a lot and the spider veins ended up coming back. Lots of money paid out of my pocket. The femoral hernias are the most likely of all hernias to strangulate or incarcerate and end up in gangrene. Gangrene due to lack of circulation or poor circulation. Femoral hernias are near to the female organs. Take care of yourself and please be advocate for yourself!! im really bloated after surgery for a femoral hernia 5 days ago? will it go down? I had a femoral hernia (strangulated) repair done 16 years ago and had to have it repeated 3 years later as it had collapsed (it took me almost 3 years to get a doctor to 'listen' to me). A double mesh was used the second time around. I have had constant pain ever since (13 years) and no doctor has been able to explain why (I have been to many over that time). Only 1 doctor had an explanation - that the surgeon must have caught a vein or similar in the last repair which is causing me grief. He gave me 2 shots of cortisone which helped immensly, but this cannot be used more than a couple of times. I get a little relief from Celebrex, but rarely take them. I had another Ultrasound yesterday and the doctor just in passing said my femoral vein was enlarged. Could this be my problem? I am desperate for some answers on this as it affects my quality of life considerably. I am a 62 year old female and am not obese. The hernia appeared when I sneezed while lying on my back - ouch! I had no pain but the surgeon assured me this was risk free while rolling his eyes at having to warn me of side effects and possible complications. In fact, since the surgery it has been only pain and it seems to be getting worse. There seems no point trusting to this bunch of idiots so how do I take this stupid mesh out, which is clearly causing me far more problems than it solves? I just want to get rid of it. This surgery has been a disaster for me and I wouldnt recommend it to any other woman. If I could have some diagrams of where to cut so I can get the mesh out Id be grateful. I want to know what activities should or shouldn't I do until my surgery for Femoral hernia happens in 6-10 months,though the surgeon wants it to be an elective,and in that lengh of time,can turn into an emergency.Option is if I can be ready in 48 hours if there is a cancellation,but I cannot due to familym and work reasons. I asked If Cardio Vascular Surgeon can repair a bilateral femoral hernia at the same time he is doing a femoral arterial bypass?Rush reply Since my question was not answered 1st time around. I am needing advise. I went out of work Jan 26 2012 for extreme pain few months and several doctors later was diagnosed with a femoral hernia. Surgery was preformed apox in April long incision running down my pelvic area from top of pantie line to bottom. a mesh was used and I have been numb from center of vaginal area to part way down my thigh and how tingling all the way to bottom of my foot. I too was told possible nerves caught in stitching. however doctor didn't want to go back in and remove mesh.I was sent to see a neurologist. I have been on gabapentin 900 mg 3 times a day, tramadol 50mg 3times a day, as well as Xanax and percocet ever since needless to say i am a walking zombie and cant focus or remember much of anything. i started weaning myself off started with Xanax and percocet then reduces times a day was taking other two brains a little less foggy still have hard time remembering things and now I have run out of meds thought this would be a good thing and as it turns out pain and tingling are as bad as ever and its 10 months since surgery was done. I hate not being able to work or or function in my daily life but I cant handle the pain I am in either. any advise would be great. also if in boise area any recommendation for a doctor to see don't want to go back to same ones. I had surgery a week ago for a femeral hernia. I have a lot of pain in my thigh,a pulling in my stomach, a it feels like my muscle is tearing. Is this normal pain? I take the pain meds but they don't do much. I am very uncomfortable. Should I see my doctor or is this normal? This comment is Kari : You try Topamax instead of Neurontin ( gabapentin) I was on that and it made me gain up to 160. lol I went down to 120 with the proper diet - not much exercise :) and Topamax, I wasn't in the stupor that Neurontin put me in! Maybe it doesn't do that to everyone, but it did to me. Percocet upset my stomach they put me on a pain patch which leveled out the pain and I became awake again. I do take Lyrica to help me sleep and help with other pain and I wake up refreshed. idk if this will work for you, and I am still in pain but I am functional and that alone helps with my mental outlook on life. I do also take Wellbutrin - of course I had a truck rear end me.. my situation is a little differentm but the medication itself can't be that much different. My husband (lol!!) is the one that had the femoral hernia operations - 2 of them - had 3 femoral hernias total! Within three weeks after surgery I had this very huge bulge in the same location of incision on my left side. The VA doctor said that it was a femoral hernia. So they put a plug (Bard mesh perfix plug), it's rare in men I have read. I have returned back to work but so has a severe pain in the same area as the plug. Should I go and talk to my Dr? Or is my body adjusting to this plug in my body. It has been 6 -7 months since surgery. i had a surgery 4 years ago for a femoral and inguinal hernia,is there a possibility that i will get pregnant again?me and my husbond are waiting for my pregnancy but unfortunately it does'nt.is my operation of femoral and inguinal affects for not having a baby. I had emergency femoral hernia 7 months ago. so far I have had good luck no problems except I get a burning sensation sometimes, which could be from a scar tissue. I had a bad cough for several months, so my doctor told me that was most likely what it was from. I had a wonderful surgeon in toledo , Ohio where I was visiting and this happened I was in the hospital for seven days but I also had COPD which was a danger putting me to sleep for surgery, it was explained to me they left nothing out I can't thank the doctors and staff at Mercy hospital for the care they gave me. and today I am doing good except for copd I am on oxygen at night and some through the day. but back to my hernia I really have to watch getting constiptated. I am so afraid this will come back at my age . I want to know what to watch for besides a lump I really am afraid to do any thing physical. I've had a femeral hernia done two weeks ago and I have a ball inside where the hernia would have been now , it move it hurts, it's painful to touch, it's about the size of a maltezer. I just wondered if this is normal and will I get a follow up appointment to see the doctor? My daughter had a femoral hernia repair 18 months ago, was diagnosed in sept 15 with CRPS( complex regional paid syndrome) she is still in so much pain, mainly abdominal pain in the groin area, every time We go do the doctors, they tell us there is nothing they can do. They say she has nerve damage at the age of 13. The pain may go or it might stay. I had hernia operation 11 years ago but now i have diagnosed that hernia comes back. What is the solution now ? Hello anyone,im lying in bed,screaming in severe pain in my groin.im sweating to death and am do nauseus.ive had kids,gallstones etc but this pains just as bad.im by meself.im scared,crying.im morphine intolerant and have had gabapentin & tramadol(last resort)& accupan.i dread going into nhs hospital as they will only give me paracetamol.i dont know what to do.im 60 female type 1 diabetic.feel like saying bye to the world honest to God. I am amazed but feel like I'm not alone! Pretty good physical condition until 2 months ago when bulge appeared while on vacation. A week later develeped severe lower back pain and got an appt with obgyn. He diagnosed hernia and sent me to a surgeon. Surgery now almost 4 weeks old but discovered enlarged lump nodeswhich was also removed, while trying to get back to normal activity noticed swelling going down everywhere but in pubic area, hellacious bursts of pain in that area and back aches seem to have returned. I'm convinced there is correlation with nerves in femeeral area, lymph nodes and back pain, but not sure why pubic area still affected. Want to hear comment from medical community. Going back to docs to discuss issues as quality of life is impacted and ability to go back full time to job. I had open femoral hernia repair done 4 months ago. There was a black mass and a lymph node stuck in it. I was told I should not be in any pain. It's been 4 months and still around the incision, the inside of my thigh, the back of my hip going down the inside of my leg and also stabbing pains in my libia. The doctors keep telling me it will go away in time and it's because they had to cut through so much tissue and nerves and they take a long time to heal. Well, I looked up this procedure and there are 3-4 main nerves that are not to be touched or nicked or cut. If these nerves are damaged then these are areas you will feel pain. This could be from the procedure or the mesh itself which many meshs have been recalled due to this and many other complications. Now, no doctors want to own up to these mistakes because there is a class action law suit commencing over these meshes. I advice anyone in pain after a hernia surgery to ask for your medical report which you are entitled and find out which mesh was used. Mine was a Bard mesh plug which was one that was recalled. Go to the internet and look up mesh lawsuit. All info will be there. If your doctors are not going to help you or even warn you about these meshes then you must act for yourselves. In the older days they sued up the opening and no mesh was used. Less complications.